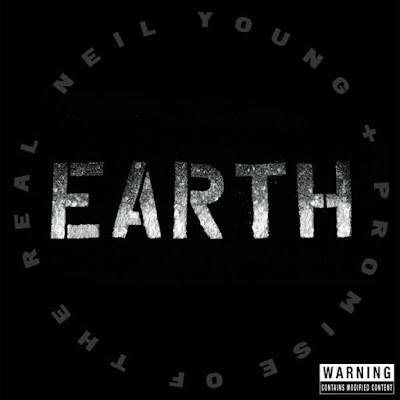 Neil Young and The Promise Of The Real will release a new live album, “Earth”, on June 17. The set mixes 2015 concert readings with the Promise Of The Real band – featuring Willie Nelson’s sons Micah and Lukas – alongside ambient elements like car horns, insects and animal sounds. The project offers 12 tracks from Young’s career and “I Won’t Quit”, an unreleased tune the rocker debuted at Farm Aid 30 in Chicago, IL last September. "I'm very happy with what I'm doing," Young told Rolling Stone earlier this spring about the project. "I don't know what its place is in the world, but I like it. I feel really good and amped and energized. And I feel like I'm doing something that I've never done before. It's not just music. It's a soundscape. It's kind of like flying around listening to things with your eyes closed." Young will host the first public playback of “Earth” via his Pono high definition fidelity audio format at The Natural History Museum in Los Angeles, CA on Friday, May 6. The “An Evening With Neil Young” event will also feature the musician discussing the creation of the new LP and is being presented as part of the museum’s First Fridays series. More details and tickets are available here. Young and Promise Of The Real launched their spring 2016 dates this week in New Braunfels, TX; they’ll play the new Orleans Jazz & Heritage Festival on May 1 and a launch a European tour in Glasgow, Scotland on June 5.